I'm laid up recovering from a broken ankle right now, and hoping to be back on the water by mid-October. So in the mean time, I'm catching up with fly tying and other non-physically demanding activities, including reflecting on recent fishing trips. The last time I was out with clients was two weeks ago, and it was an unusual three days. Leading up to the weekend, I'd watched the weather like a hawk, fearing that my clients would be dropping into a tropical storm. But the forecast never quite triggered my alarm, so I planned to do my best for the three days Bobby McConal (from Kerrville) had planned for his sons, Scott and Sean. Bobby has his own boat--a NewWater Ibis--and has a good knowledge of the Lower Laguna. However, he wanted his boys, who are brand new to fly fishing to fish with a guide who doesn't do anything else, and who could give them pointers about mastering the "quiet sport." We awoke to thunderstorms on Friday morning, so we agreed to wait until the weather cleared. We didn't get on the water til almost noon, but it was beautiful out there. After a storm, when the winds die, the fish can turn on and begin tailing in ernest. The wind never quite died, but we headed for an area where the reds often tail in the wind. I hoped that we could see them in the low light of overcast skies. 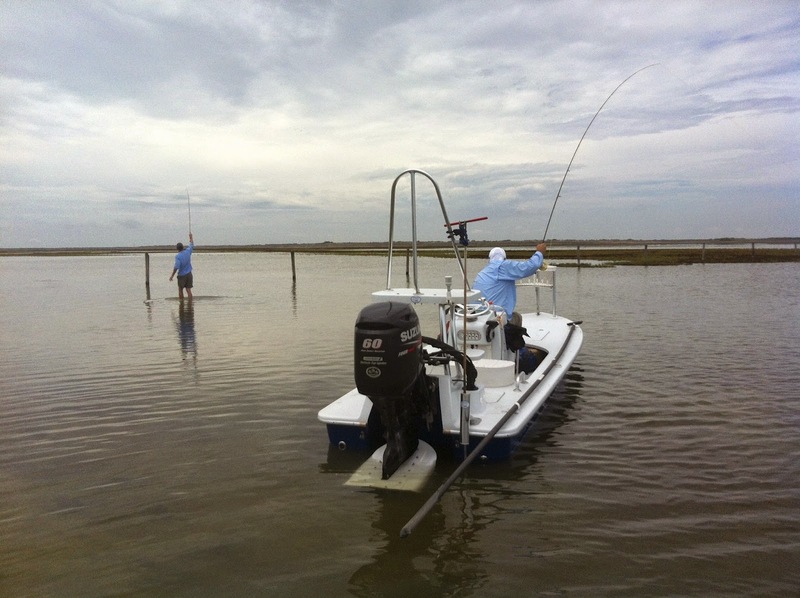 Scott and Sean are athletic, and have a lot of angling experience on the Texas coast. 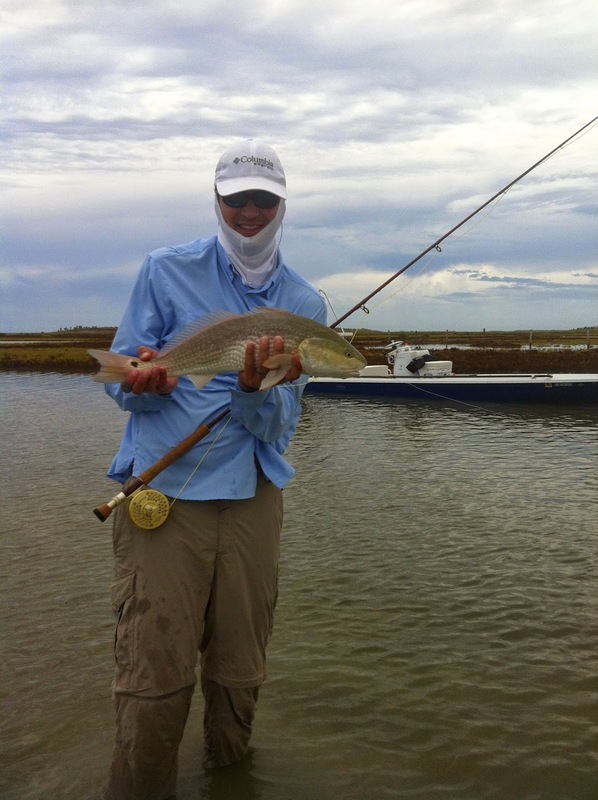 So even though they are new to flyfishing, they have a feel for the bay that newcomers often lack. Indeed, they were attuned to the subtle signs of redfish, especially after I urged them to remove their sunglasses in the low light. Most people leave their sunglasses on when the sun goes behind the clouds, but it's very difficult to see tails unless the eyes have a high-contrast field of vision. Indeed, when they removed their glasses around 2 pm, they started seeing tails that other people would never have seen. Youthful vision combined with high-contrast low lighting proved to be a great recipe for sight casting. After landing two reds in the shallow, clear venue, we went to an area that is often muddy by afternoon, but attracts huge reds that are feeding in virtually no water on baitfish. I don't know anyone who fishes this particular area, and it's a real treasure. It doesn't look like much, so it's not likely to attract anglers looking for visible fish. But in the 7-8" water, the big reds show themselves as they sweep around like sharks looking for inattentive mullet. Indeed, when the oversized reds suddenly attack their prey, they can be 10 feet away, and it can be heart-stopping. 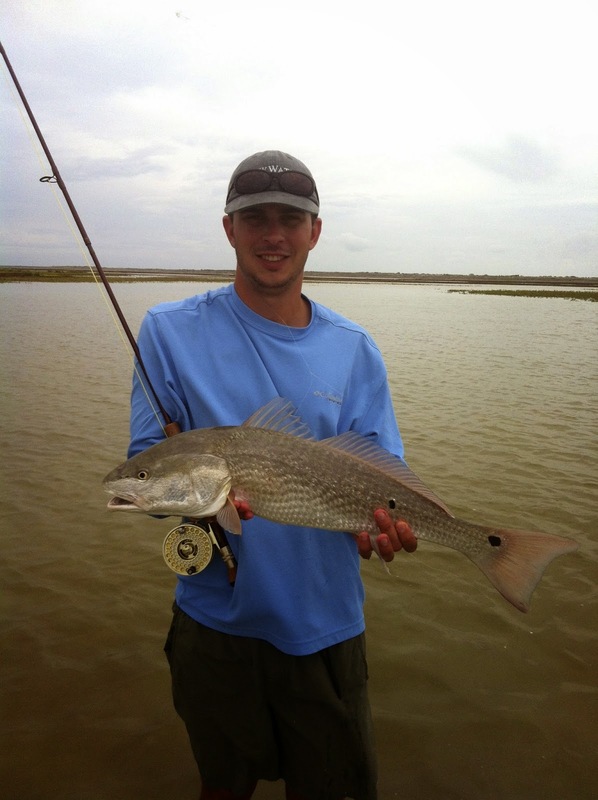 We waded slowly into the area, and were rewarded by the explosive sounds and sights of feeding redfish. Foamy craters were visible in the aftermath of the explosive predators, and it was a bit intimidating to enter their sanctuary, where thousands of finger mullet were milling around waiting to see if their time was up. The fishing was tough! Most of you know that I rarely "blame the fish," but these wary, oversized reds were as tough as any fish I've ever targeted. In the off-color water, it was difficult to get them to see the fly, and when they finally did, they were usually offended. Sean and I briefly snagged one of the big boys apiece, but both of the fish came off after a brief hookup. Meanwhile, we all had excellent shots at three or four 27-30" fish, but except for the two brief hookups, the fish reacted badly. We vowed to return to the "hall of giants" the next day in hopes that the water would be a bit clearer, or the fish more willing, or both. 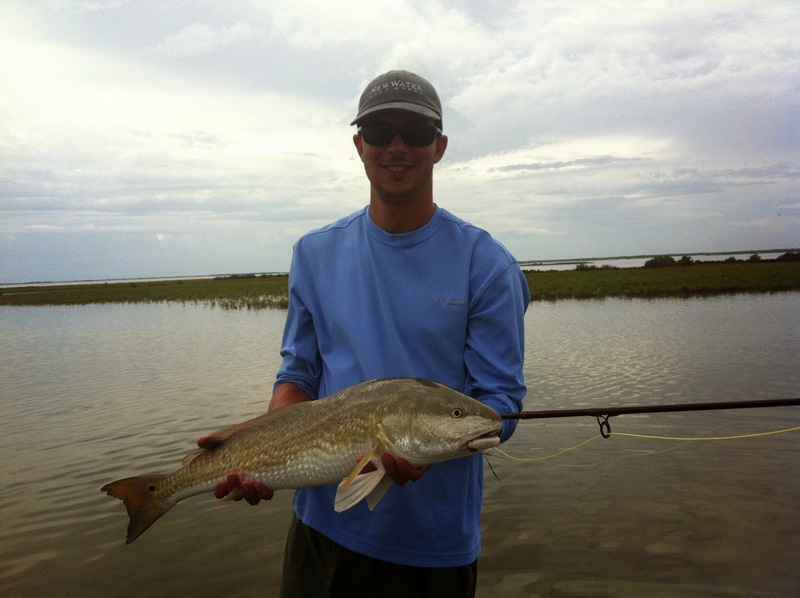 The guys only landed a redfish apiece by the time we went in, but they had several other pick-ups and a hook-up or two more, as well. They were definitely ready for the next day. But the conditions were, once again, prohibitive at daybreak. A line of thunderstorms swept up from the south, and pommeled the Lower Laguna. We watched the radar for a couple of hours, and concluded that it would be a while before we could safely go out. So I decided to go back to our RV and take a nap. I asked the boys to text me if the radar cleared before my return. Well...I slept through their text. I awoke to the message, "Dad and Danny have already left, and they say the bay is clear." I jumped up and hurried back to Bobby's house, feeling that I'd screwed up by sleeping through the alert. But the guys weren't upset at all. Leaving a few minutes later than we otherwise would have, I finally shook off my sense of having failed them, and shifted my focus to deciding where to go first. It was only 8:30, and a whole day still lay before us. And a great day it was. We started in the same area where the guys had caught a couple the day before. I was thinking that we'd start there, and end up at the "hall of giants" at the end of the day. Everything else was up in the air. But, unfortunately, there weren't any pods working in the shallow clear water. The tide had risen to fall levels in response to the tropical low pressure circulation, which had water westward into the lagoon. So I found myself poling into a more remote part of the back lack, hoping that there was enough water to have drawn the reds into the back areas. As we poled along in the low wind, we could hear the birds and other natural sounds in all directions. That's when we began to hear exploding fish hundreds of yards away. We couldn't see them at first, but we took a bead on the sound, and poled closer. Then, against an "island" of exposed glasswort we saw the first unequivocal redfish explosion. Poling closer, we could see the fish saunter into the vegetation, feeding like a big bass among the lily pads. That was too much for Sean, who grabbed his rod and slipped overboard into the 10" water. We left him approaching the island, and turned further west toward some other explosions that were announcing the presence of multiple redfish feeding. Soon, Scott was off the boat, as well, walking stealthily toward a pass between two glasswort islands, where an abundance of mullet were milling and jumping in the tidal exchange. Before Scott could get into position, Sean yelled and we saw that he'd hooked up. Later, he told us that he had to cast into the glasswort thicket in order to get the fish's attention. Knowing how hard it is to present a fly in that kind of situation, I was full of praise. Meanwhile, Scott waded into the pass between the islands, and surveyed the water carefully. He said to me that there were several very big reds working along the edges of the islands. He began casting and after a few minutes hooked a red that ripped through the shallow water and headed for the next county, albeit unsuccessfully. Scott fought the big fish masterfully, and brought it to him as I approached to assist him. I could see that it was a pretty big fish, to which Scott said, "the other one was larger." And then I saw that the one he had hooked was huge. It turned out to be a solid 29 inches, perhaps even 30. We photographed it and released it. An excellent start on the day. I wasn't sure where to go next. We poked our way northward along the west shoreline until we came to a spot that I hadn't fished in a quite a while, because the tides had been too low to justify it. On speculation, without a great deal of hope that we'd find anything, I turned west and headed into a very remote area. Black drum were everywhere, and we soon saw a couple of reds, as well. Still, I wasn't too optimistic; that is, until I looked ahead and saw the back of redfish near the left shoreline, heading in our direction. Things were looking up. I got Sean into position, so he could cast from the boat. Sean put the fly to the right and left of the fish, but the fish didn't see the fly. Finally, the fish was literally 10 feet from the boat when Sean got the fly to the sweet spot. Breathlessly, we all looked on as the fish inhaled the fly and shot off. As Sean fought the red, I looked up the shoreline, and there were at least two more reds heading our way. Scott grabbed his rod and jumped off the boat so he could cast. Within a minute, he was hooked up, too! The guys waded into the area, and had several other shots, but because the sun was hidden behind the clouds, it was had to keep the feeding fish in your sights. Scott landed another nice red before we headed elsewhere. Our hope, of course, was that the reds would be back in the hall of giants, but alas, every day is different, and they weren't there. For that, I guess I'm glad. Not that I wanted the guys to struggle and have a bad day, but it's good to know that no place is always "on," and that every day presents us with challenges and puzzles for which there is no easy answer.